CAPE CANAVERAL, Fla. - The space shuttle Discovery is poised to blast off earlyTuesday in what promises to be a stunning nighttime launch into the dark Floridasky. Discoveryand a crew of seven astronauts are due to lift off from a seaside pad here atNASA?s Kennedy Space Center at 1:36 a.m. EDT (0536 GMT) and begin a 13-day constructionflight to the International Space Station. ?We havebeen studying and training hard for about a year now and we are ready to accomplishthis mission,? said Discovery commander Rick Sturckow. 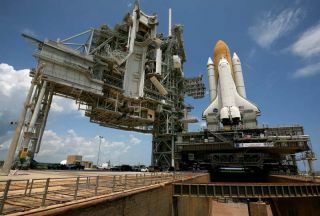 Discoveryhas an 80 percent chance of good weather at launch time early Tuesday, but onlyif Mother Nature cooperates later this afternoon when NASA fuels the shuttle?sexternal tank. The moon should set late Monday night, giving Discovery a completelydark sky to launch into, mission managers said. Shuttleworkers plan to begin loading Discovery?s 15-story external tank with the morethan 526,000 of super-cold liquid hydrogen and liquid oxygen propellant atabout 4:11 p.m. EDT (1911 GMT). There is a chance that lightning within 5 miles(8 km) of the shuttle?s Pad 39A launch site could stall the fueling operation,and even the launch if the delay runs too long. ?Overall,the weather is looking good for launch, we've just got to get there,? said NASAshuttle weather officer Kathy Winters. ?So the tanking weather is what we'll bewatching very closely.? NASA launchdirector Pete Nickolenko said his team could delay fueling Discovery?s tank byabout three hours and still make the Tuesday morning launch window. Lightninghas been a thorn in NASA?s side in recent months. A lightningstrike in July forced NASA to delay the liftoff of shuttle Endeavour inorder make sure the spacecraft was in good health. Sturckowleads a six-man,one-woman crew that includes shuttle pilot Kevin Ford and missionspecialists Patrick Forrester, Jose Hernandez, Daniel Olivas, Nicole Stott andSwedish astronaut Christer Fuglesang, who represents the European Space Agency.Ford, Hernandez and Stott are making their first spaceflight. They planto deliver a cargo pod packed with packed with about 15,200 pounds (6,894 kg)of new science equipment, fresh supplies and a treadmill named after comedian StephenColbert. Colbert triedto have NASA name a new room for the space station after him by urging fans towrite his name in during an online poll by the space agency earlier this year.NASA, ultimately chose the name ?Tranquility? - after the Apollo 11 moonlanding site - for the room, but offered Colbert the treadmill as a consolationprize. ?We?re justexcited to haul it up there,? Sturckow said. ?This has been a long time in theconstruction phase and for awhile it was questionable if it would even make ourmission.? NASA invited Colbert to watch the Discovery's launch, but he was unable attend. Instead, NASA will broadcast a statement from Colbert later tonight on NASA TV after fueling Discovery. Discoveryis also carrying new science experiment racks to boost fluids and materialsresearch aboard inside the station. A new ammonia coolant tank, which weighs asmuch as a small car, will be installed at the station during the mission?sthree spacewalks. Unlike hercrewmates, Stott is not planning on returning to Earth with Discovery after itsmission is completed. She will stay behind and replace NASA astronaut Tim Kopra,who has lived aboard the station since mid-July and will come home onDiscovery. ?I?m reallylooking forward to that first view,? Stott said in a recent briefing. ?I expectthat it won?t get any less impressive every time you do it.? Discovery?sflight will mark NASA?s fourth shuttle launch this year and the second to blastoff at night in 2009. ?In thisbusiness there are few sights as beautiful as a nighttime launch,? said NASAtest director Charlie Blackwell-Thompson in a recent briefing. ?And I expectthis to be a spectacular sight as Discovery roars to life early Tuesday morningand lights up the night sky.? SPACE.comis providing complete coverage of Discovery's STS-128 mission to theInternational Space Station with Managing Editor Tariq Malik in Cape Canaveral,Fla., and Staff Writer Clara Moskowitz in New York. Click here for shuttle missionupdates and a link to NASA TV. Live coverage begins at 8:30 p.m. EDT.